Elegant Lyon, whose old town is a UNESCO world heritage site, is the gastronomic capital of France. The historic streets of vibrant Vieux Lyon are extremely atmospheric and bursting with quaint bouchons, terrific, traditional bistros that historically were inns or post houses. They contrast deliciously with the new wave, creative cuisine coming out of the city’s numerous Michelin starred kitchens. Chefs from around the world come to train here and foodies from everywhere make gourmet pilgrimages to the city’s most famous eateries. The citizens of Lyon live to eat; the locals think about food, talk about it and are always busy planning the next meal. Daily food markets are bursting at the seams with just picked (by hand) fruits and vegetables, artisan cheeses, fresh made pastries to swoon over, baked breads, local truffles, wild honey, local Bresse chickens, air dried Jambon (French cured ham), wines from the nearby outstanding Côtes Rôties and Beaujolais vineyards and so much more! 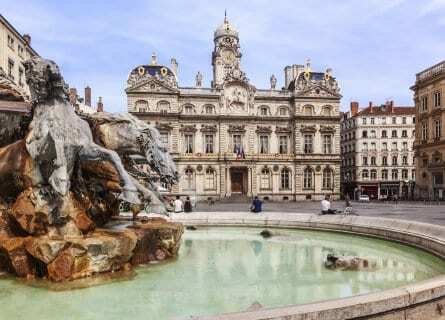 On this fabulous private tour of Lyon, you will taste your way through the city and enjoy both traditional and modern examples of Lyonnaise cuisine. 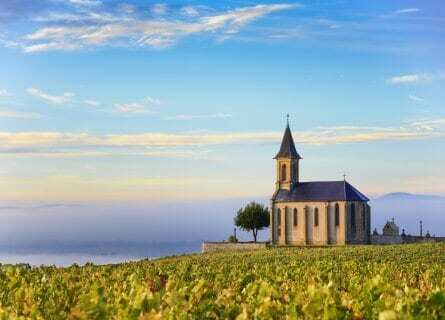 You will spend a day in the vines visiting up and coming wine producers in the picture postcard dreamy region of Beaujolais followed by a Michelin starred gourmet tasting menu with wine pairings in an 800-year-old castle. In Lyon, you will have a culinary expert take you food shopping, learn how to prepare a traditional Lyonnaise meal with a local chef and enjoy guided tours of the truly remarkable local markets including Les Halles de Lyon – Paul Bocuse. And the ultimate highlight of this trip is without a doubt, your dinner at Three Michelin starred L’Auberge du Pont de Collonges de Paul Bocuse- exceptional! Arrive at Lyon’s airport or train station and your friendly driver and elegant Mercedes will be waiting. Transfer to your beautiful hotel to drop off luggage and freshen up. You have a relaxed welcome lunch today at Michelin starred chef Christian Têtedoie’s renowned grill eatery La Terrasse de l’Antiquaille on Fourvière hill. Dine on the glorious terrace (weather permitting) overlooking Lyon. Enjoy fresh and light delicious dishes like Scallops and Prawns “a la plancha” or perhaps a tartare of Charolais beef. The views are second to none! After lunch, your private certified art guide will take you on a digestive walk of Vieux Lyon. The architecture from this UNESCO listed quarter is from the Renaissance epoch and you can admire stunning façades and palais, a testament to Lyon’s wealthy past as a center of silk production. You will see many “Traboules” (there are hundreds of them), curious passageways that run beneath or even through private buildings often via a courtyard, making a secret maze through the old town. The name comes from the Latin “Transambulare” (walkthrough), and these alleyways date back to the 16th century when silk carriers created the house to house passages as shortcuts. They were used heavily during WWII by the resistance as escape routes, and you will hear stories and anecdotes. The late afternoon and evening are yours to keep exploring or rest up. You might like to visit the Basilica of Fourvière, overlooking all of Lyon (it’s a healthy hike up and back). You are staying at the loveliest hotel in town, a restored Renaissance structure with romantic décor and a stunning interior of various arched courtyards. You can dine onsite (there is a one Michelin starred restaurant at the hotel as well as a more casual offering). The Pure Altitude Spa has some great anti-jet lag treatments! Welcome to lovely Lyon. The verdant hills, medieval hamlets and historic châteaux of the beautiful Beaujolais await you. This gorgeous wine region north of Lyon (and just south of Burgundy) specializes in fruity red wines made with the Gamay grape. Despite the fact that the region is one of the oldest wine regions in France (vines were planted here by the Ancient Romans), until very recent years the Beaujolais wines were considered to be simply easy going, light, everyday wines (not collector’s wines). However, there are many passionate winemakers making increasingly serious wines and you will taste some of the best examples of Beaujolais being made today. There are ten villages that have attained “cru” status which going north to south include Juliénas, St-Amour, Chénas, Moulin-à-Vent, Fleurie, Chiroubles, Morgon, Régnié, Brouilly and Côte de Brouilly. This morning you will visit 2 contrasting estates, for instance, Domaine Richard Rottiers where young cult wine celebrity Richard is crafting beautiful expressions of Moulin à Vent which unusually for the region have barrel aging; and perhaps a visit to Château Grange Cochard in scenic Villié Morgon where the English owners, the Wildings, who took over the estate less than a decade ago have already achieved such accolades as 90 Parker points for their Morgon Vieilles Vignes made with 80-year-old vines. Carry on to the bewitching Château de Bagnols, an authentic castle dating back to the 13th century, complete with a moat, honey-colored towers, and a drawbridge. It now houses a five-star plush hotel and Michelin starred restaurant La Salle des Gardes, which you will enjoy. Set in a majestic dining room, the pedigreed chef Jean Alexandre Ouaratta previously worked at Bocuse as co-head chef, at Parisian 3* Le Meurice and at the Royal Mansour in Marrakech. You are in for a real treat with some culinary surprises today with a tasting menu and wine pairings, sit back and indulge! After lunch, visit the beautiful hamlet of Bois d’Oingt for a short digestive walk and then pop into an artisan chocolate maker and a goat farm to pick up some fromage de chèvre for tomorrow’s cooking class. 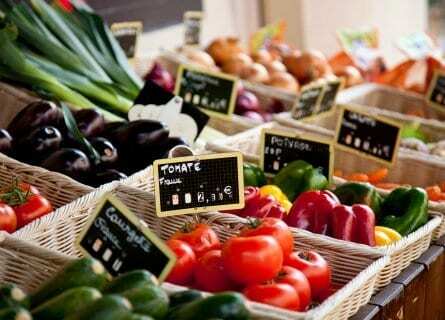 Dine on your own tonight at one of Lyon’s mythical “Bouchons”. We suggest Brunet, a really cute traditional bouchon in the heart of Lyon, with all local dishes on the menu such as Salade Lyonnaise (green salad, croutons, bacon and poached egg), Quenelles (Lyonnais dumplings with velvet crab sauce), and Cervelle de Canut (whipped fresh cheese with herbs, garlic, shallots, and cream, translates amusingly as “silk weaver’s brain”). After a light breakfast, you have an early start today to take in a visit to an authentic bakery where you will learn the art of bread kneading and Lyonnaise baking. Follow with a tasting of a selection of their bread (hence the suggested light breakfast). You will take away a selection of delicious bread, madeleines, and the local tartes à la praline for lunch later. Your private culinary guide will take you food shopping next at the Croix-Rousse market where you will also taste some of the ingredients for lunch cooking class. This neighborhood nestled in the north of the city was where the silk workers lived in the 16th century and the area retains a warm, village atmosphere with many inviting bouchons and art galleries. The daily street market along the Boulevard de la Croix-Rousse is extremely picturesque with flower vendors and every conceivable local delicacy you could hope for from Saint Marcellin fromage to Rosette de Lyon Saucisson. After the shopping, stroll around the market on your own, have a café. Lunch is next and it is a cooking class in a charming chef’s apartment where you will prepare a Menu du Marché and sit down together to enjoy with a nice white Burgundy. The afternoon is yours then to explore Lyon’s many cultural offerings from the Roman ruins to the Institut Lumière, located in the Auguste and Louis Lumière brothers’ art nouveau mansion (they invented cinema with their cinématographe which is housed in this museum along with other cinematic gadgets). Tonight, you have a cooking class dinner, using the goat’s cheese and chocolate from your Beaujolais excursion. 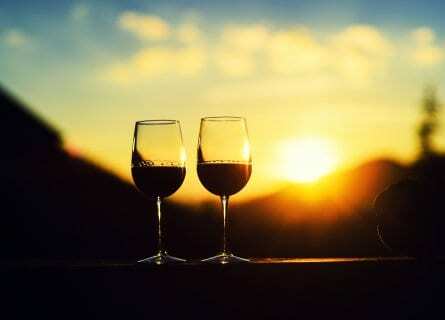 Sip wine while you cook and enjoy the casual atmosphere, at the same time adding new culinary tricks to your repertoire. 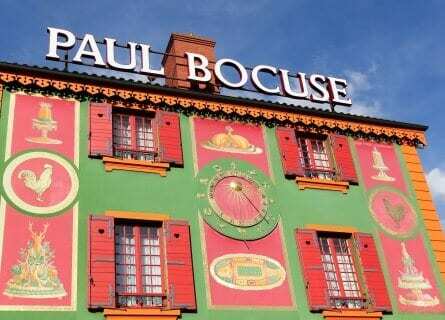 Monsieur Paul Bocuse is nothing short of a culinary god in Lyon and his restaurant is considered by many food critics to be the most prestigious restaurant in the world! Today is all about Bocuse, and you will start with a visit to the extraordinary Les Halles de Lyon Paul Bocuse. This covered market is indeed named after Bocuse and is a gourmet Mecca. Its where Lyon’s chefs buy their top produce and where the locals come for food splurges, the quality is top notch and this is one of the highest end markets in France. With one of the market’s famous chefs you will enjoy a VIP tour of Les Halles, with the best vendors pointed out to you and their wonderful offerings explained. A private cooking class is next, but first a fun blind, wine tasting! You will learn the French “Art de la Table” and dessert will be the chef’s surprise…. a most delightful afternoon! Free time then in the afternoon to freshen up, sightsee, shop. Dinner tonight is at the mythical L’Auberge du Pont de Collonges de Paul Bocuse on the Saône river. Paul Bocuse, now in his late 80’s still warmly greets guests at the restaurant and you might catch a glimpse! This is a once in a lifetime experience for food lovers, you will create wonderful memories here at this self-described culinary circus, indeed dinner is a wonderful show! At your preferred time our chauffeured Mercedes will transfer you to your next port of call. We hope you had an amazing time on this food and wine tour of Lyon!